The most discussed roster move this spring has finally been made. The team announced today that Jackie Bradley Jr. will be promoted to the 25-man roster and will be the Opening Day left fielder for the Boston Red Sox. First baseman Mauro Gomez was designated for assignment in order to clear a spot on the 40-man roster. The 22-year-old pushed the envelope this spring, hitting .433/.521/.633 with 10 walks and nine strikeouts. A center fielder by trade, Bradley will slide to left field, with Jacoby Ellsbury manning center and Shane Victorino in right. This is an unprecedented move in the post-Dan Duqette era, as no position player has been promoted to the majors faster than Bradley. Bradley has played only 61 games above A-ball since being drafted in the supplemental first-round out of the University of South Carolina in 2011, which is far fewer than the second-place Ellsbury, who had 154 games above A-Ball. Bradley hit .359/.480/.526 in 67 games with High A Salem last year, and then hit .271/.373/.437 after his promotion to Double-A Portland. His best asset is his defensive ability though, including excellent range and instincts to go along with a plus arm. At the plate, he has a strong approach and projects to be a plus hitter for average, with slightly below-average power. If Bradley had started the year in the minors, and then got called up on April 12, he would not be eligible for free agency until 2019, giving the Red Sox one extra year of control in what is likely to be one of his prime seasons. However, just because he is on the Opening Day roster does not mean the Red Sox lose that 2019 season. If he his sent down to the minors for a total of 20 days during the course of the season, Bradley would not be credited with a full year of service time, giving the Red Sox that one extra year of control. That second scenario seems likely to happen once David Ortiz returns to the lineup. The Red Sox will look for Gomez to clear waivers and accept assignment to Triple-A Pawtucket, as first base is a position of relative weakness just below majors. 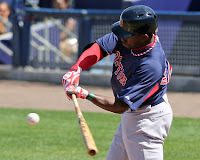 The 28-year-old batted .310/.371/.589 with the PawSox last year and won the International MVP award despite playing only 100 games at the level. He put up a line of .275/.324/.422 in 102 major-league at-bats last season.